In 1890, mineralogist Edward J. Hoppmann and the city of Duluth alike were riding high on mining money and a real-estate investment boom. Hoppmann commissioned ever-popular architect Oliver Traphagen to build him a fine four-story brownstone office building on the site of the former Minnesota House hotel at 421 West Superior Street. He undoubtedly hoped the building would stand tall for many years, acting as a physical monument to what a German immigrant could accomplish in the New World. Within three years of its erection, Hoppmann leased the three upper floors of his building to a new tenant, who opened a European-style hotel called the Hotel Brunswick. (European-style hotels did not include meals along with boarding fees, as opposed to the “American Plan” which included three meals a day.) A buffet restaurant and saloon operated on the ground floor. 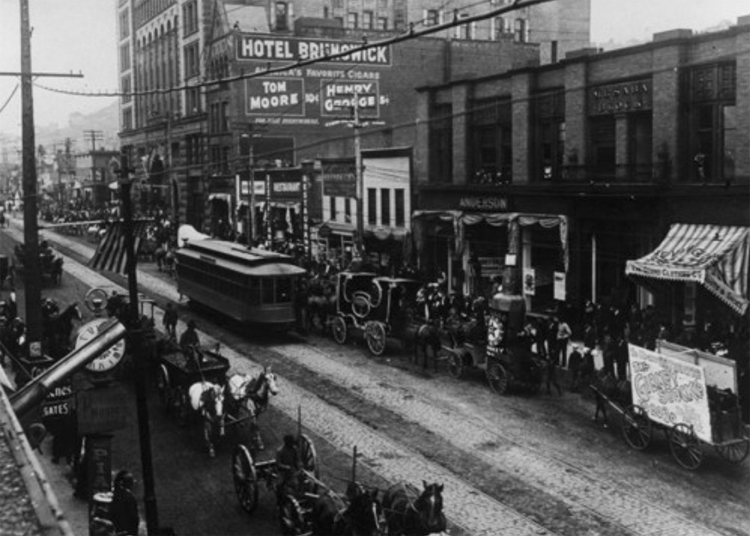 Located within a block or two of all of the city’s railroad passenger depots, right next door to the Lyceum Theatre, and across the street from the Spalding Hotel, the Hotel Brunswick was well situated to serve the best of Duluth’s clientele. But that location would also soon become the heart of Duluth’s Bowery which, like its New York namesake, became the city’s center of vice from roughly the mid-1890s until the early 1960s. From the outside, all seemed to be well at the Hotel Brunswick. The Hoppmanns were on-site landlords, living in rooms behind the building. However, those in the know likely caught a whiff of impropriety wafting out of its doors. By 1896, the Hotel Brunswick operated under the management of a woman named Delia S. Klein. She was well known to Duluth’s more free-wheeling set as the wife of real estate speculator Solomon Klein, whom everyone simply called “Sol.” According to his 1899 Duluth News Tribune obituary, Sol was “a man of the type that is often described in print, but infrequently met with in real life—a square, a high-class gambler, who would not stoop to do a mean act or resort to unscrupulous methods to win another man’s money.” Sol’s mental health took a turn when he hit his forties, and his habitual generosity turned manic. He began to speak and act in grandiose ways that regularly set the streets abuzz. First, he told everyone that he had a gold mine in Pike Lake. (No such mine existed, though he took people there to see it, and was reportedly unfazed when nothing was there.) Then he tried to get investors involved in a golden opportunity he described as a sure thing. He told friends he’d bought Isle Royale and was going to make the island into a Lake Superior Monte Carlo, drawing steamers from around the Great Lakes to his fantastic casino paradise. Worried, Sol’s friends intervened, and he was “spirited away” to the insane asylum in Fergus Falls, where he eventually died. Immediately upon public announcement of his death, a mysterious group of men began digging holes around the upper reaches of the Incline Railway, looking for what was rumored to be “buried treasure”—$10,000 in gold coins buried by Sol the Gambler. Newspapers reported eye-witness accounts of a “veiled woman in black,” who drove by regularly in her buggy to supervise the project, and that a “woman clairvoyant” had also visited to help the men determine where to dig. All such tales were dismissed by the diggers and Widow Klein. If any treasure was found, no one ever reported it. During the subsequent legal battle between Sol’s New York relatives and Delia over her dead husband’s estate, however, it came out that Delia and Sol were never legally married. Delia insisted they were married “by common law,” and used his name until the end of her life. Years later Rip-saw muckraker and reckless moralist John Morrison set his sights on the Hotel Brunswick, noting that it “ever has been the center of high life and excitement. Irrigation parlors have occupied the ground floor and no one but the devil himself knows all the stunts that have been pulled off on the upper floors.” Morrison never accused Mrs. Klein of prostitution (which he certainly would have done if he felt like it), only saying she had rented out rooms to “old friends of her husband at good prices.” However, a few incidents at the hotel during Mrs. Klein’s reign may indicate more to the story. In 1903, two men were apprehended after stealing $800 worth of diamonds from an unspecified person at the Hotel Brunswick. Precious stones were then, just as now, a convenient way to store ill-begotten income. Gamblers and brothel owners in particular were fond of this method of banking. Then, in 1906, a chorus girl named Emma Moon went missing during her stay at the Hotel Brunswick. Her manager told the press that she’d been kidnapped by “three lake captains,” who took her to Superior and then, “on a trip down the lake.” Miss Moon’s fate is unclear.